Precious Times Developmental Daycare aims to provide high quality childcare to pre-school-aged children in a secure, nurturing, healthy and educational environment. Precious Times Daycare aspires to provide a program of diverse activities which are developmentally age-appropriate within an atmosphere that is warm, loving, and supportive of each child's home life. It is our belief that young children need to be a part of the community, and as such be involved in age-appropriate ways. Children should be exposed regularly to activities that foster learning through play to explore, experience and succeed. At Precious Times Daycare, we value the uniqueness of all children and hope to support working families in the unified goal of raising responsible, considerate, caring, contributing, life-long learners. Precious Times Developmental Daycare is owned and operated in the warm, loving home of Jamie and Justin Moodie. Located in beautiful Ottawa, Canada, Precious Times Daycare has been in operation since the summer of 2006. Hi! 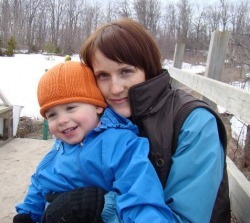 I'm Jamie Moodie, owner and proprietor of Precious Times Developmental Daycare. I am 30 years old, and have 11 years of experience working as a nanny, teacher and child care provider. I am also the proud mother of 2 wonderful children - Fynnley and Tommen. I started my 'career' with children at the age of 19 when I deferred University and nannied for a family with two young boys. It was here that I first discovered my love for working with children. I also decided then that when I became a mother, I would want to stay home with my children because the pre-school age was such a 'precious time.' After just over a year, I moved to Australia to pursue my Bachelor of Education in Brisbane. I worked as a live-in nanny for a little girl while completing my degree. I taught in Australia for a year, then South Africa for one semester. Upon my return to Canada, I got a job with the Ottawa Carleton District School Board and taught for 3 years until I became pregnant with my daughter. I came into starting a home daycare after the birth of my daughter - I had a hard time finding 'the right' care for her. I found daycares I liked, but the location wasn't convenient. I found convenient locations, but daycares that weren't in line with my parenting philosophies. Thus, Precious Times Developmental Daycare was born! Now, I love that I have the opportunity to get up every day and work with children while staying home with my own two kids. 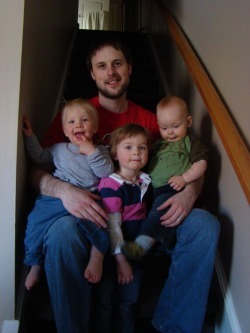 I feel privileged to be able to have found a balance between work and family life. I find great fulfillment in being an important part of each child’s life that I care for and consider it a privilege to care for these children. Their smiles and laughter change my world and brighten my day. I wouldn’t trade my job for anything. Justin is my loving husband whom also has a love for working with children. After pursuing a degree from CarletonUniversity in the Arts, he moved to Taiwan to teach English to children in a private school setting. It was here that he too, learned he loved working with children. From there, he decided to return to Ottawa and go back to University to obtain a Bachelor of Education. Upon completion of his degree, Justin has been supply teaching in the Ottawa Carleton District School Board in a primary school setting. To him, this allows him the perfect balance - he gets to be home with our children helping in the daycare a few days a week, while still pursing his chosen career. Justin anticipates continuing to supply with the school board until our own children are in school, then he will search for a full-time position. Until then, he enjoys the balance that the daycare has given him and the children are always amused by 'the big kid' that comes to play!